This is a three day liveaboard course where we circumnavigate Narragansett Bay entering multiple harbors with lots of anchoring practice and close-quarter maneuvering under power. The focus is on navigating and managing the boat systems over several days. On the first day we would cover boat systems, docking, and meal planning. We would also go over the planned trip and navigation. In the afternoon we would practice docking and picking up the mooring; and anchoring if time permits. That evening the students would shop for food and stock the boat, then do the chart work for the trip. The second day we would review boat systems and check the chart work. Then we leave on our trip of about six hours navigating as we go. Upon arrival at our destination we would review anchoring procedures, and then relax for a bit until dinner. Dinner would be on the boat at anchor. After dinner we would cover basic chart-plotter use and do the navigation planning for the trip back. The third day after breakfast we would review and practice anchoring, navigate back to our harbor using the chart-plotter, and practice picking up a mooring. The exam comes after we get the boat squared away. 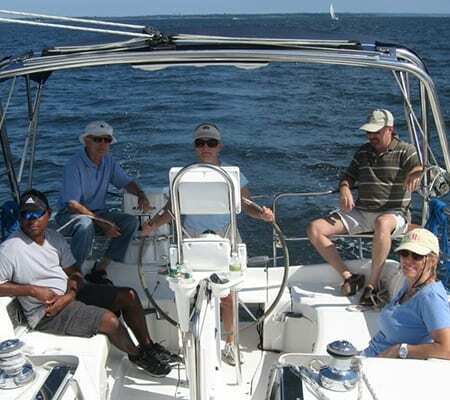 At the end of this course, a student will have the skills to take a 35’ to 40’ boat out for multiple days and will have Bareboat Certification recognized by most charter charter companies worldwide. All boat expenses are included. Food is extra.